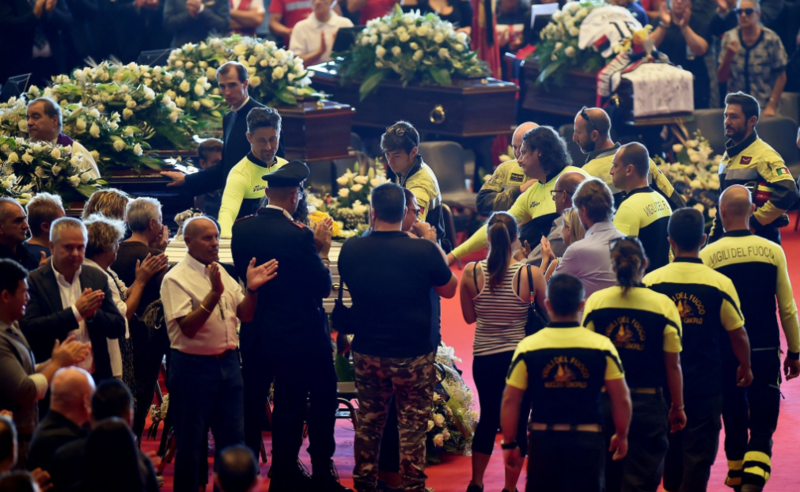 The church was too small to hold the thousands of mourners who wished to attend the state funeral on for 18 victims of Tuesday's bridge collapse in Genoa. Italian President Sergio Mattarella and PM Giuseppe Conte led the ceremony as some politicians (Maurizio Martina, the secretary of the former ruling Democratic party was greeted with shouts of "buffone," clown and "vergogna," shame on you) were booed and others (Interior Minister Salvini from the populist Lega Nord and Deputy PM Mr. Di Maio of the populist Five-Star-Movement) were cheered. Crowds held a standing ovation as the firefighters who have been pulling bodies from the rubble entered to pay their respects. As this morning the bodies of a family of three were found dead under the rubble, the tragedy's death toll now stands at 42. Rescuers warned of still finding more bodies as they go through the concrete remains. Related coverage: <a href="https://thegoldwater.com/news/34075-Italy-Salvini-Blames-Toll-Operator-Autostrade-For-40-Dead-In-Genoa-Catastrophe">Salvini blames toll operator Autostrade for 40 dead in Genoa catastrophe</a>. Prime Minister Conte confirmed that legal proceedings were now underway to strip the toll operator Autostrade per l'Italia of its contracts, saying: "today the government… has formally sent to Autostrade per l'Italia the letter of complaint which launches the process for revoking the concession."